A Maryland man was sentenced to 25 years in prison Friday for plotting to blow up a military recruiting station. Antonio Martinez, a Muslim convert also known as Muhammad Hussain, pleaded guilty in January to attempted use of a weapon of mass destruction. 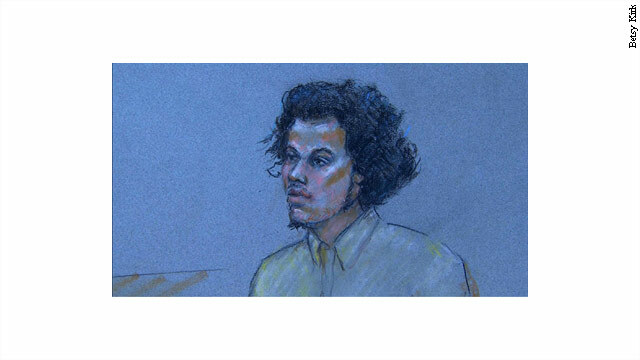 Martinez was arrested on December 8, 2010, after he tried to set off a bomb at the armed forces recruiting station in Catonsville, Maryland. The FBI became aware of Martinez's intentions and started an undercover operation. Investigators made sure the materials in what appeared to be a bomb were inert. According to a plea agreement, Martinez talked about attacking military targets with an FBI undercover source on October 22, 2010. The source later introduced Martinez to a man he described as his "Afghani brother" to assist in the plot, but the man was actually an FBI undercover agent. Martinez told the "brother" he wanted to make jihadist activities his "profession." Law enforcement recorded conversations with Martinez during which he identified the military recruiting center as his target. According to a Justice Department news release, Martinez also "spoke about his anger toward America, his belief that Muslims were being unjustly targeted and killed by the American military, and his desire to commit jihad to send a message that American soldiers would be killed unless the country stopped its 'war' against Islam." The government said Martinez tried to recruit others to participate in his scheme, but everyone turned him down. One person even tried to talk Martinez out of his plans, according to the Justice Department. Court documents said Martinez made postings on Facebook and expressed militant beliefs. According to the plea agreement, Martinez admitted he met the confidential source to drive to a parking lot near the targeted recruiting station. Along the way, Martinez had the man use a camcorder to tape Martinez making a statement that he would continue fighting until "those who waged war with Islam stopped their actions." Martinez tried to set off the bomb but failed. He admitted it was intended to kill military service members. "We are catching dangerous suspects before they strike, and we are investigating them in a way that maximizes the liberty and security of law-abiding citizens," said Rod Rosenstein, U.S. attorney for Maryland. A message left for Martinez's attorney was not immediately returned. Changed his name to muhammed hussain? Thats somewhat of an indicator isnt it? Should have picked Adolph Dahmer, or something a little less conspicuous. and than on top of all that he will have to deal with the guards . the people making his plans could very well be other prisoners . ENJOY ! This is a problem I think. spare no terrorist to survive, they are meant to die. People that are so simple minded need to die..eh?